The ultimate Mount Kilimanjaro trek giving the best possible chance of reaching the elusive summit. A successful ascent of Kilimanjaro, the highest mountain in Africa, is achievable by any fit trekker. We have carefully researched the best way to increase your chances of succeeding on Kilimanjaro, which is essentially a summit that is achievable by any reasonably fit trekker. Without a doubt acclimatisation is the key and by climbing Mount Meru first and then by following one of the longer routes up Kilimanjaro, you dramatically increase your chances of success. Mount Meru is a spectacular mountain in its own right and an excellent acclimatisation trek and preparation for the climb up Kilimanjaro. It is also an interesting contrast to Kilimanjaro, being situated in the Arusha National Park, home to leopards, giraffe, zebra and buffalo to name but a few of the animals that you will hopefully encounter on your trek up Meru’s lower slopes. After a gradual start, Meru is an exciting scramble to the top, with a dramatic ridge walk and stupendous views of Kilimanjaro and the Tanzanian plains way below. Kilimanjaro by contrast, is a vast mountain with several summits, arising out of the plains of northern Tanzania. It is a slow, steady walk to the top and your guide will rightly advise you to go ‘pole, pole’ (slowly, slowly), and if you do so, with our carefully designed itinerary to maximise acclimatisation, you will have the best possible chance of reaching the summit. The Lemosho route climbs through beautiful, peaceful forest to reach the Shira plateau, before walking around and gradually up the lower slopes of Kilimanjaro to the high camp at Barafu. From here your final ascent will start in the early hours of the morning and it is a long, steady climb to the crater rim at Stella Point at 5,752m/18,980ft. Once you have reached Stella Point, the gradient becomes easier for the walk up to the summit, Uhuru Peak. Standing at 5,895m/19,340ft, watching the sun rise over the African plains, and the icy glaciers and peaks of Kilimanjaro gradually coming into view is a tremendous thrill, and the perfect conclusion to your Kilimanjaro trekking holiday. Not only will you go home with wonderful memories and photos but you’ll also receive a certificate to prove your summit success. Thousands of mountain lovers undertake a Kilimanjaro trek (affectionately known as “Kili”) on holiday every year, and Mountain Kingdoms provides a Kilimanjaro trek that gives you the best possible chance of reaching the summit. You may have heard that there are national park fees to pay for climbing Kilimanjaro and Meru. Please note that these are included in your trek price, and there are no extras to pay on entering any parks. Meal arrangements: All meals where stated are included. 12 breakfasts, 12 lunches & 12 dinners. Fly to Kilimanjaro International Airport. Drive to Arusha National Park. Start trek up Mount Meru. Ascend to Saddle Hut. Summit Mount Meru for sunrise, 4,556m/14,947ft. Descend to Miriakamba Hut. Drive to Kilimanjaro. Trek to Shira 1. Trek to Shira 2 and on to the Great Barranco Valley. Trek to Barafu via Karanga Camp. Ascend Mount Kilimanjaro, 5895m/19,340ft. Descend to Millenium Camp. Trek to park gate. Drive to hotel and fly to London. Depart UK for your flight to Kilimanjaro International Airport. Day 2 - Arrive in Kilimanjaro. Group transfer to lodge. You will be met on arrival at Kilimanjaro International Airport and transferred to your hotel, about an hour's drive from the airport. The hotel is set is stunningly beautiful gardens, and there are extensive grounds. Weather permitting you should get good views of Mount Meru from the lodge. Day 3 - Drive to Arusha National Park. Start trek up Mount Meru, 2,514m/8,248ft - 5 hours. You will be picked up in the morning by your guide for the one hour drive to the entrance of the Arusha National Park. There is an excellent view of your objective, the dramatic and rocky, Mount Meru from this spot. The half hour drive from here to the Momella Gate should give you glimpses of some of the diverse range of animals that you will be seeing over the next few days, including zebra, buffalo, giraffe and warthogs. At the Momella gate, 1,514m/4,975ft, you will meet your ranger and start the trek. The path is a well-graded track, winding gently uphill through pristine forest, with clearings, waterfalls and hopefully with plentiful sightings of animals. You will stop for lunch, possibly at Fig Tree Arch before continuing uphill to the Kitoto viewpoint with amazing views of the Momella Lakes to the east and the Ngurdoto crater. This area is home to giraffe and leopards. After a short descent you reach the Miriakamba hut. Day 4 - Ascend to Saddle Hut, 3,570m/11,713ft - 5 hours. The start of your walk today is uphill through beautiful forest. The path is very well-maintained and, after a couple of hours (and hopefully spectacular views of Kilimanjaro), you reach Elephant Point. This is an excellent place to stop and admire the views of the crater plain that you crossed yesterday and which is now way below. The path continues to zigzag up the ridge and then the flank of the mountain, with gradual changes in vegetation as you reach the alpine zone. You will get your first sightings of heather, senecio and if you are lucky chameleons, in this region. After a break at the Saddle Hut, you can walk to the top of Little Meru 3,820m/12,533ft, improving your acclimatisation. It will be an early night before your very early morning start up Mount Meru tomorrow. Day 5 - Summit Mount Meru, 4,556m/14,947ft - 8 hours. Descend to Miriakamba Hut, 2,514m/8,248ft. Your guide will wake you up in the very early hours for your start up Mount Meru. (This is excellent practice for Kilimanjaro). The aim will be to reach a good viewpoint on Mount Meru for the sunrise. The trek starts gradually, crossing the saddle before reaching a ridge at Rhino Point. The path then climbs to follow the edge of the crater rim. After 3 or 4 hours you reach the first of several false summits, and the final scramble to the top comes not a minute too soon. You return by the same route to the mountain hut, where you will have lunch before descending to 2,514m/8,248ft for the night. Day 6 - Descend to Park Gate, 1,514m/4,960ft - 3 hours. After the efforts of the previous three days, you have a pleasant walk back down to the park gate today. This follows a different route from the ascent and is a stunningly beautiful walk through parkland hopefully containing much wildlife. Amongst the many animals you may well see close by are baboons, giraffe, warthogs, and buffalo. A short detour takes you to the Tululusia Falls for a break before you walk across the plain at the bottom of the mountain. Your vehicle will meet you at the park gate before a one hour drive back to the hotel. Day 7 - Drive to Kilimanjaro - 3-4 hours. Trek to Shira 1 Camp, 3,505m/11,499ft - 1-2 hours. After breakfast your Kilimajaro guide will meet you at your hotel for a pre-trek briefing after which you will drive to Londorossi Gate at the National Park's western entrance. The gate is set right on the edge of beautiful forest and it is here that you will meet your trek crew and porters. After signing the book it is a short drive up a muddy track, past fields of potatoes and carrots, to the start of the trek. The path sets off climbing gradually through thick forest, full of birds and black and white Colobus monkey and the more common blue monkeys. After only a couple of hours you will reach your camp for the night. Day 8 - Trek to Shira 2 Camp, 3,840m/12,598ft - 4 hours. Acclimatisation trek towards Lava Tower Camp. Day 9 - Trek to Great Barranco Valley, 3,985m/13,074ft - 6-8 hours. The route to the Great Barranco Valley today is via the Lava Tower. It is a steady walk uphill, around huge lava blocks and through sparse vegetation to reach the Lava Tower 4,640m/15,223ft, a huge block on the end of a cliff. There is a cold and windswept campsite here, but you will just have a lunch stop before descending to the Great Barranco Valley. The valley is a lovely spot, with giant lobelia and senecio and the magnificent views of the Heim Glacier, Kili's southern face and the Western breach. You will also be able to view your route up the Great Barranco wall tomorrow. Day 10 - Trek to Karanga Camp, 4,040m/13,254ft - 4-5 hours. Acclimatisation walk. Day 11 - Trek to Barafu Camp, 4,640m/15,223ft - 4-5 hours. Acclimatisation hike. Day 12 - Ascend Kilimanjaro, via Stella Point, 5,895m/19,340ft - 7-8 hour trek. Descend to Millennium Camp, 3,820m/12,533ft - 2-4 hours. 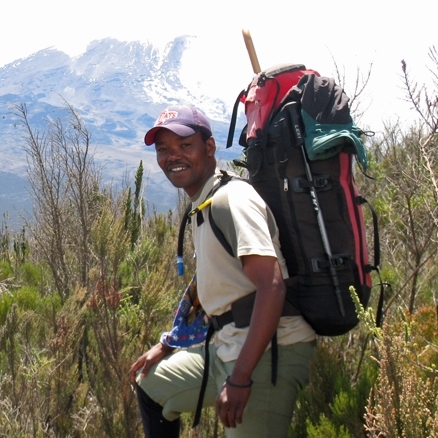 Day 13 - Trek to Mweka Park Gate, 1,640m/5,381ft - 4-5 hours. Drive to hotel. Day 14 - At leisure. Group transfer to Kilimanjaro Airport and fly to London. Day 15 - Arrive UK.